Do you want a slow, steady energy supply? Would you like to prevent chronic disease? Eating the recommended three servings per day of this food has been shown to reduce heart disease by 28 percent, stroke by 36 percent and type II diabetes by 30 percent. Substituting this food 3 times a day for its processed counterpart will help you manage hunger, eat less and ultimately maintain your weight. You eat to derive energy from protein and carbohydrates you eat, right? You need to eat this food with its fiber intact as it has Manganese, and it plays a key role in the synthesis of fatty acids to receive that energy you’re looking for when you eat. What is it, you ask with enthusiasm? 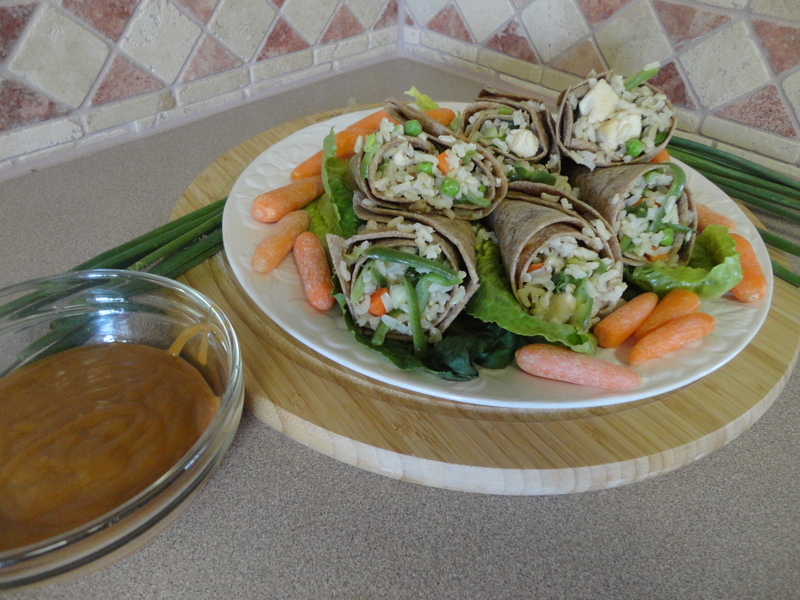 It’s 100% whole wheat, and brown rice, and here is a recipe from Splendid Recipes and More that will provide you with 1 of those 3 servings per day, plus your Manganese for energy: Oriental Chicken Wraps. Dice two green onions and chop chicken breast into 1 inch pieces and set aside. Heat oven to 300 degrees. Wrap tortillas in foil and warm for 10 minutes. Shown here in the image, we are using our counter top Nuwave oven. Cook rice according to package instructions with 1 cup of chicken broth and 1 cup water. In a small sauce pan bring 1 cup chicken broth to boiling. Add frozen vegetables and turn heat to low. Simmer 2 to 3 minutes. Just allowing vegetables to thaw out and warm up. Turn off heat and set aside. Next add chopped chicken breast to a large frying pan over medium heat. Cook chicken until no longer pink and cooked through. Spoon the warmed vegetables to a medium boil along with the cooked chicken pieces. Next add cooked chicken, rice and vegetables to a large bowl. 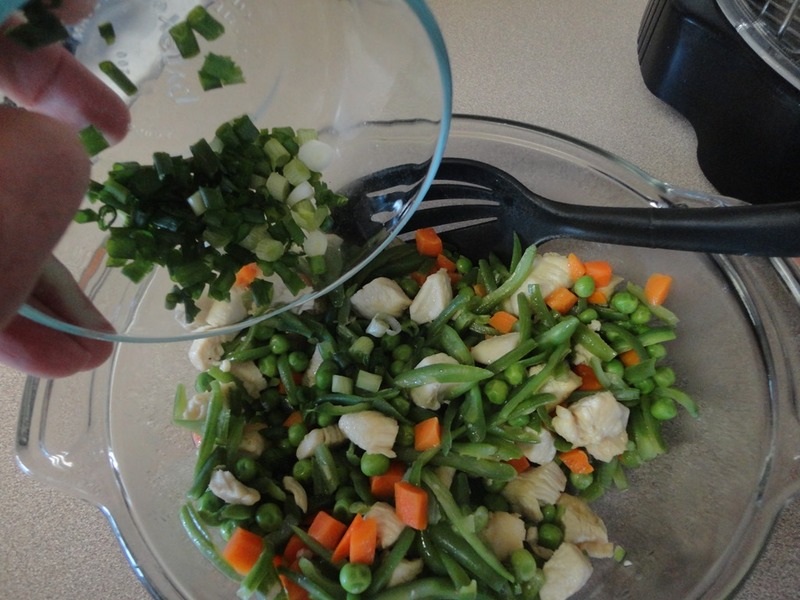 Add green onions, and mix till well incorporated. 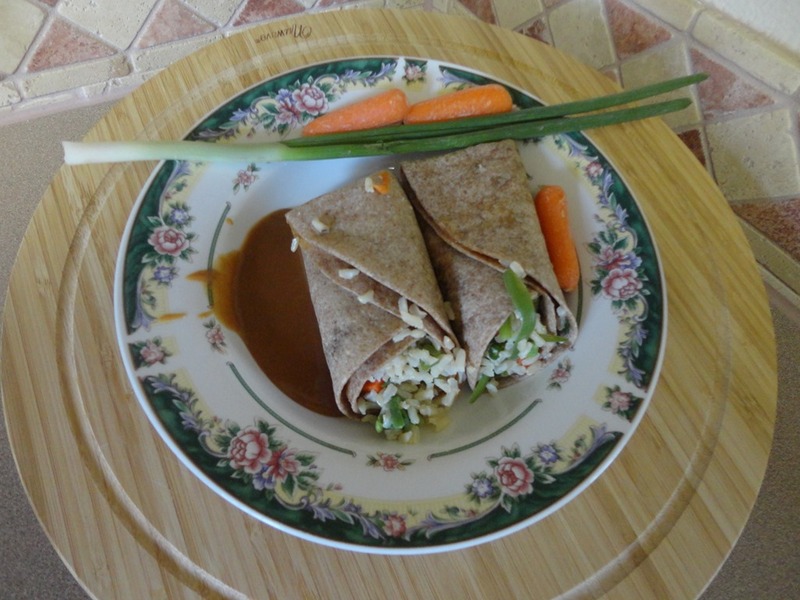 Next, spread peanut sauce on one side of warm tortilla. Fold in half, roll up into a cone shape and fill with chicken mixture. Plate and serve. Serve with additional peanut sauce, if desired. 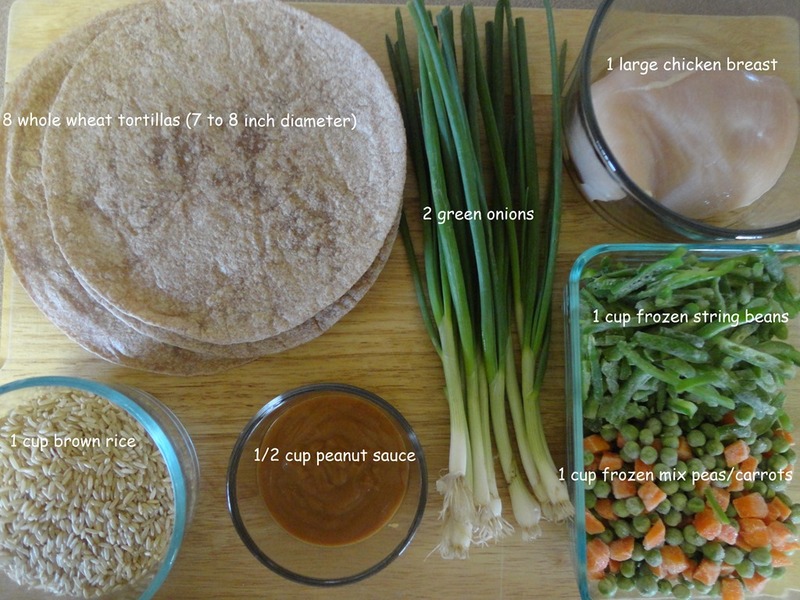 This entry was posted in Chicken, Main Dish and tagged Barbecue chicken, Broth, Chicken, chicken breast, chicken broth, Chicken Recipes, Cook, green onions, Peanut sauce, Sandwich wrap, Wrap. Bookmark the permalink. Thank you for the link to my post. These wraps look delicious. Love the Asian flavors. Your welcome Jovina, and thanks for viewing and leaving your comment! !